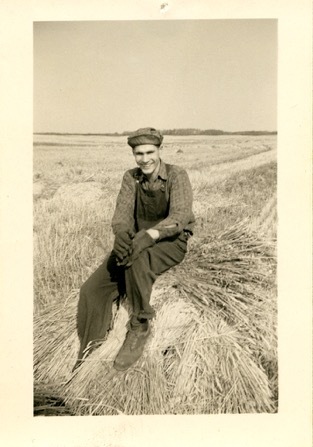 My grandfather, Peter Darcovich, at 20 years old, on a stook of wheat. 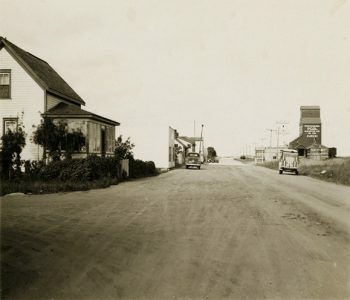 1945, Kuroki, Saskatchewan. I’m 13 or 14 years old, at one of our family reunions. I ask Grandpa if he can still speak Ukranian. He chuckles and says a few words, his sister joining in. The words make no sense to me, but the cadence is striking. I need to hear more. My mother’s side of the family gathers once every four years. Multiple generations travel from both coasts of Canada, its provincial heartlands, and from the United States to be together in the same space at the same time. I have attended these reunions since I was a small child. “What about my name?” I ask. Grandpa moves closer to me and holds a pen to a blank piece of paper on a clipboard. He angles the clipboard so I can see him write. His pen flicks along. I watch the inky symbols it leaves behind. They don’t seem to quite fit to the sounds Grandpa is speaking, the sounds I know. Next to my name, newborn in Cyrillic, Grandpa writes my name in the alphabet I am used to. The two versions of me pose proudly side-by-side, distant relatives reunited. My grandfather has always been a kind of historian-storyteller, cataloging and preserving moments in time to be shared, learned from, and appreciated. He is one of our family photographers, filming family trips and gatherings even before handheld video cameras had sound. Before cameras went digital, Grandpa would write information on the back of each photo to note its subjects, the date it was taken, and the location. At the family reunions we have, Grandpa’s work is always featured. We watch his old videos over and over. There seems to be something new to discover each time, some detail nobody saw before. We yearn to revisit these moments. The family clusters into one room, fills up rows of chairs, and watches our past flicker before our eyes. My grandfather was born on a farm in Michalin, Ukraine. In 1928, when Grandpa was not yet three years old, his parents decided to leave the region because of Soviet-Ukrainian tensions, harassment from Polish police, and the threat of further warfare. At that time, Canada was still looking for immigrants to farm and populate the western prairies. The national railways had signed an agreement with the Canadian government to recruit immigrants from Northern and Central Europe. My grandfather’s family left Ukraine and traveled to Denmark. After a week of showers and inspections in Copenhagen, Grandpa and his family traveled eight days by ship across the Atlantic and landed in Halifax, Nova Scotia. 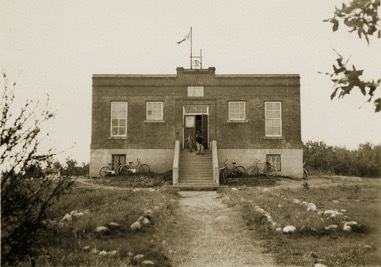 From there, they traveled more than 2,500 miles west by train to get to the tiny farm village of Kuroki, Saskatchewan. This is where my grandfather’s family began their lives anew. not have much money. Once a year, they would get oranges delivered by train to their village. Grandpa has always told me that they ate the entire orange, even the peel. My great-grandparents could not speak any English and relied on my grandfather and his siblings to translate news on the radio as best they could, or to speak with local shopkeepers and the like. As the children grew, they spoke less Ukrainian and more English in the house, but our heritage has not been discarded. I was born 63 years after my grandfather was, thousands of miles from the places where he grew up. When my grandparents came to meet me for the first time, Grandpa looked upon me – a tiny, wordless bundle – and thought about what my name should be. My mother and her siblings all have common Biblical or one-syllable names: Mary Jane. Nancy. Ken. John. Grandpa suggested I be given a Ukrainian name. I often think about this choice. My name works to bridge the gap of time. It unites me with a land where I have never been, but a land whose people’s blood is my blood. I’m sure my grandfather knew this when he named me, though he has not said it out loud. When I consider who I am and what I am becoming, I see my family reflected. Grandpa and his relatives have documented their lives and preserved history through the written word, photography, and video. As a graduate-level journalism student at Northwestern University, my work relies on these same media to share information with my community and with the world. Each day that I pick up my camera, talk to someone about their experiences, and craft a story, I know I am continuing the legacy that my family began so long ago when they immigrated to Canada. They did not know how their journey would change them, or how they would change the lands they moved to, but they trusted that their hard work would bear fruit. Much the same, I am thankful for the journey I am on, thankful for the opportunities to struggle and strengthen, and thankful for the chance to honor my name.